In 2009, a team of doctors and scientists at the Medical College of Wisconsin shook up the medical community by successfully sequencing a young Wisconsin boy’s DNA in order to identify and treat an unknown, life-threatening disease. 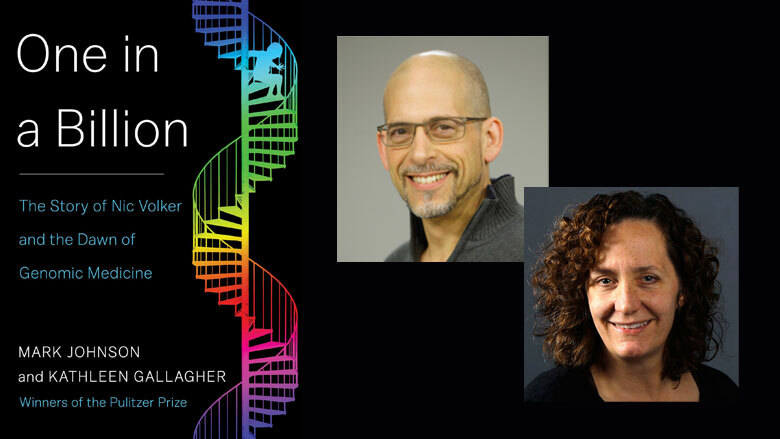 That boy’s name is Nic Volker and his story is told by Mark Johnson and Kathleen Gallagher in their compelling new book One in a Billion: The Story of Nic Volker and the Dawn of Genomic Medicine. Johnson and Gallagher, reporters at the Milwaukee Journal Sentinel, are part of the team that first broke Nic’s story in 2010 in a special three-part series in the newspaper. The articles helped the case gain worldwide attention and garnered the Milwaukee Journal Sentinel a Pulitzer Prize for explanatory reporting. The story begins with the grisly details of Nic’s disease. The young boy’s immune system is attacking cells in the lining of his intestine causing fistulas or small openings to appear that leak waste into his body. Nic nearly dies from septic shock more than once and undergoes endless operations to repair his repeatedly damaged intestinal tract. For two years, doctors are baffled by Nic’s condition. The disease leaves the boy severely underweight, and his chances of survival are slim. As Nic struggles to survive, a technology that might save his life is beginning to emerge. In 2009, Howard Jacob, a professor in physiology and pediatrics at the Medical College of Wisconsin in Milwaukee, is developing a team of scientists with skills aimed at one day sequencing the DNA of his young patients. “At this point, in late June 2009, there are no published reports of patients having had all of their genes sequenced in order to reach a diagnosis. There is no estimate for what it might cost. There are no guidelines for how to sequence a live patient,” write Johnson and Gallagher, underscoring the odds against Nic’s survival. Jacob is on track to reach his personal research goal by 2014 when he hears about Nic’s case and decides to accelerate the program. It’s a longshot, but Jacob is undeterred. Nic’s family and Jacob’s team together take the leap into the unknown realm of genomic medicine. This relatively new field of medicine sequences and then analyzes a patient’s DNA in hopes of finding irregularities or genetic mutations in the DNA that are causing the body to function improperly. In Nic’s case, the doctors have tried every other possible treatment with no success. Genomic medicine is his last chance to beat the disease. Instead of scanning all 3.2 billion base pairs, Worthey and Tschannen suggest they could zoom in on the exons, the portions of each gene involved in making proteins. Since protein problems are the cause of many genetic mutations, there is a good chance that the explanation for Nic’s disease lies somewhere in his exome. The new tool Worthey and Tschannen gamble on to scan the exon portion of Nic’s genes, the Roche NimbleGen Exome Capture Array (which, incredibly, was developed a few miles from Nic’s home), is ultimately effective and costs twenty times less than traditional sequencing methods. While the science is fascinating, the book is, ultimately, a thrilling and inspirational story about people having the courage to take risks and overcome seemingly insurmountable obstacles. Johnson and Gallagher recount how doctors and scientists crossed new boundaries and worked against the clock to deliver a cure that ultimately saved Nic’s life. When Nic’s story was first told in 2010, his case became a worldwide phenomenon in the medical community. Nic and his family were interviewed by Matt Lauer on The Today Show and the demand grew for genetic sequencing for sick children with unknown diseases. The work that took place in Milwaukee inspired other medical organizations like the Duke University Medical Center and Baylor College of Medicine to create their own genetic sequencing laboratories. In late 2015, David Adams, the deputy director of clinical genomics at the National Human Genome Research Institute, polled experts around the country and estimated that between 10,000 to 20,000 patients and their relatives had genomes sequenced in the past year in an effort to understand and cure unknown illnesses. Today, Nic is a relatively healthy child, living in Monona, with hopes of learning how to breakdance and do karate. His story, as told by Johnson and Gallagher, is a reminder of the remarkable things we can accomplish when we have faith and work together.